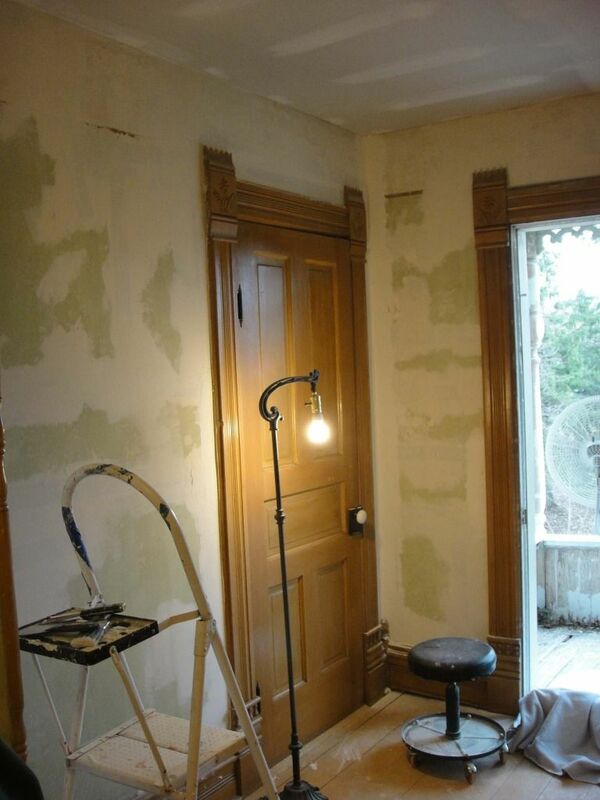 I thought I'd post some photos of progress on the upstairs hallway. It's 28ft. long, 5 ft. wide at it narrowest, and 10ft. wide at the landing. 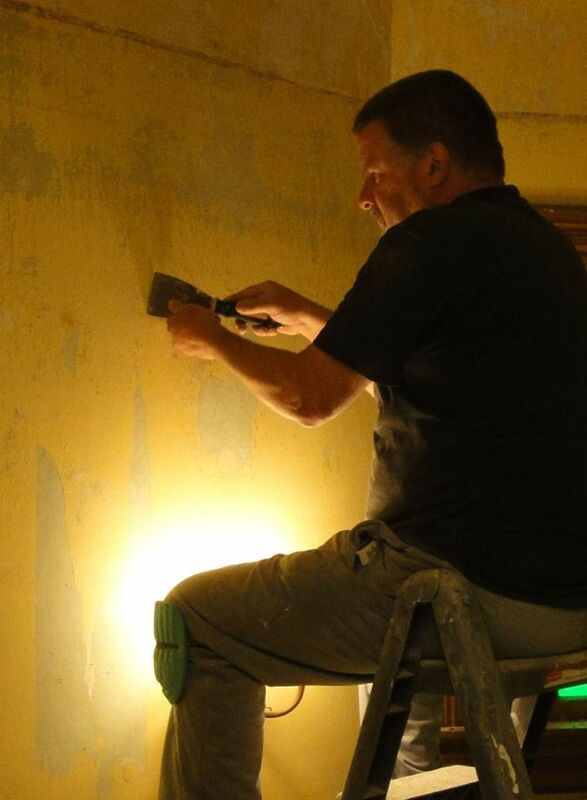 We make simple repairs to the walls, chasing the small and fine cracks-using web tape embedded with a skim coat of durabond, and feathered with skim coats of drywall compound. The walls are ready to repaint. My brother is helping me out. I'm getting older, in my sixties, and retired now. Even though I can still climb scaffolding, its the dang dust that gets to me. I do use a good respirator--makes me look like an old bug from outer space. We found lots of picture rail in the attic--to use again in the hallway. I've been very active and patient seeking out previous owner photos, education certificates, class graduation photos, and 4 original land patents for this house and its farm land 1853, 1857, and 1858 belonging to the previous owners. We're lucky to find all this--and its generous and mysterious how things that belonged to this house seem to float back to us. Here's what I'm working on now, the stairwell. 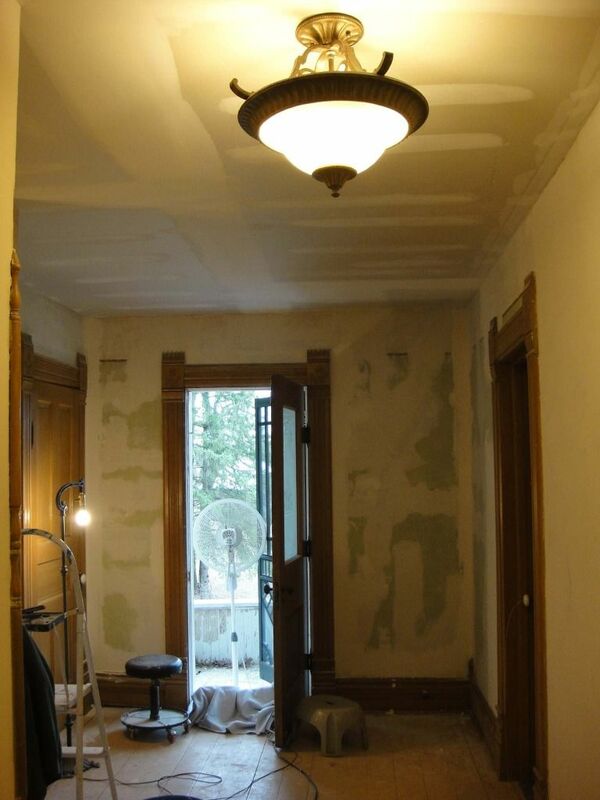 Repairing the upper area, then will remove temp scaffold and work on wall down the stairway into the foyer. "Move forward and do what you have to do"
"If everything is coming your way....you're in the Wrong Lane!" 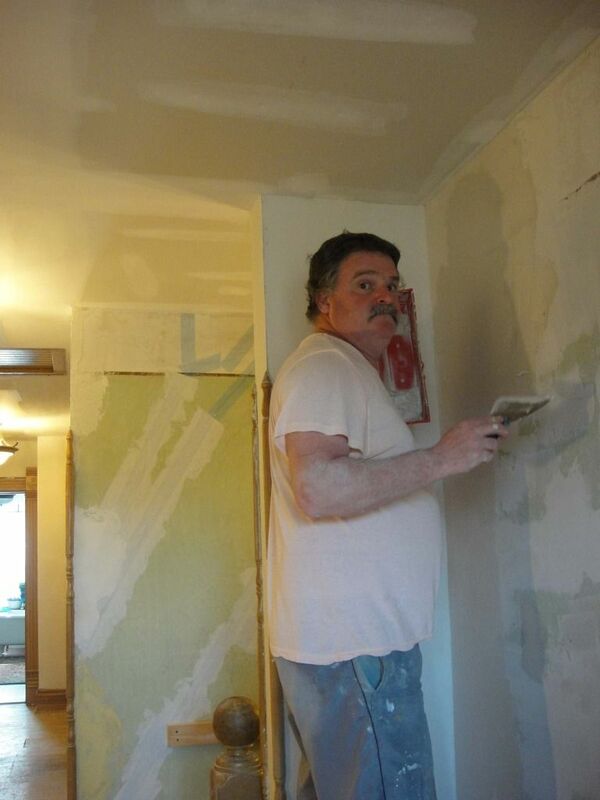 We did the same thing on the walls and ceilings of our house. I love the way the smooth plaster looks afterwards! However, there are places that I see now that could use some more work. I think we got so tired of having the house a mess while doing the patching and sanding, that we said "good enough" a little too soon. 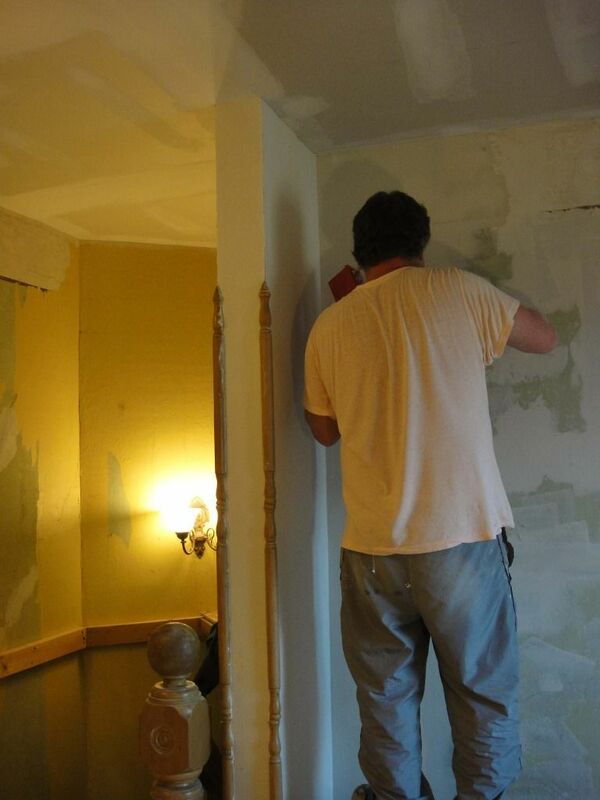 We stripped a lot of wallpaper off first and we could see exactly where the picture rail used to be. I can see the same thing in your pictures. Please post the after pictures once finished. I put wall liner up after fixing the cracks. It makes a perfect finish. Then added picture rail and painted. Looks perfect. Josiecat wrote: I put wall liner up after fixing the cracks. It makes a perfect finish. Then added picture rail and painted. Looks perfect. Just curious. Can you show some "after" photos of the wall liner installation. I'd like to see the finished result. How wide is the wall liner? What type of adhesive do you use to put up the wall liner? Does it install like wallpaper? Can you see butted edges? It's good to hear from you again, Mrs d! I've always admired your beautiful decorating. catperson wrote: It's good to hear from you again, Mrs d! I've always admired your beautiful decorating. I was thinking the same thing. I smiled when I saw that you had posted. why my comment are not posted?